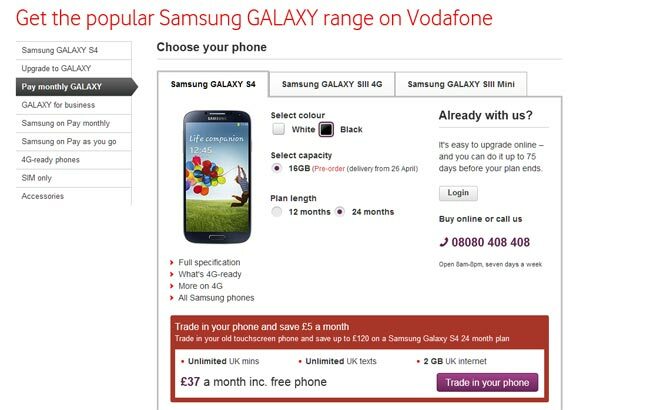 The Vodafone Samsung Galaxy S4 is now available to pre-order, the handset will be available on a range of Vodafone’s mobile contracts, and if you want the device for free it will be available on a 24 month contract which starts at £42 per month. The Samsung Galaxy S4 features a 5 inch Full HD Super AMOLED display with a resolution of 1920 x 1080 pixels, and it features Android 4.2.2 Jelly Bean, the UK version of the handset is powered by a quad core 1.9GHz Qualcomm Snapdragon 600 processor. Other specifications on the Samsung Galaxy S4 include 2GB of RAM and either 16GB, 32GB or 64GB of built in storage, it also features a 5 inch Full HD Super AMOLED display with a resolution of 1920 x 1080 pixels,you can find out more details about the device over at Vodafone at the link below.